I conduct any ceremony that marks important life events, from Funerals to Renewal of Vows or Commitment Ceremonies. Aside from wedding ceremonies, I also offer a variety of other ceremonies to mark the special occasions in your life. If you want a simple service or a more extravagant celebration, each of these ceremonies may be tailored to suit your requirements. Whether it’s a Baptism or Naming Ceremony, a Commitment Ceremony or a Renewal of Vows, a Funeral or a Celebration of Life Ceremony, I’m happy to help. Or your ceremony can also be in a more exotic style such as Mediaeval or Celtic. Other inclusions . . .
You can also add optional extras (often called rituals or flourishes) to your wedding package. 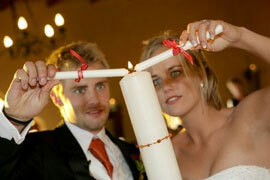 Examples are the Candle Ceremony, in which the two individuals light one big candle together, symbolising their union. A variation on the same theme is the Sand Ceremony, in which indvidually coloured sands are poured into a common container. Or the hands of the couple can be symbolically bound with a ribbon (called a Handfasting). Basically, you can add any variation you like. Parents ( for young people) . . . or adult children (for those who are older) . . . or whoever you wish . . . can also be involved in these extra options. If you are having the Candle Ceremony, your mothers (or some other family members) may light the small candles prior to your lighting the big one. If you’re having the Sand Ceremony, your mothers may bring the jars of coloured sand to you just before you pour them in. You may wonder . . . why our mothers (or other family member)? They symbolise the families from which you have come . . . your families of origin . . . as you come together to form a new family with all its possibilities . . . including children!